When you have turned off secure boot, save and reboot. You will probably end up back in Windows. Now at this point to boot into Ubuntu on the USB drive I had to again hold down the shift key whilst rebooting the computer. 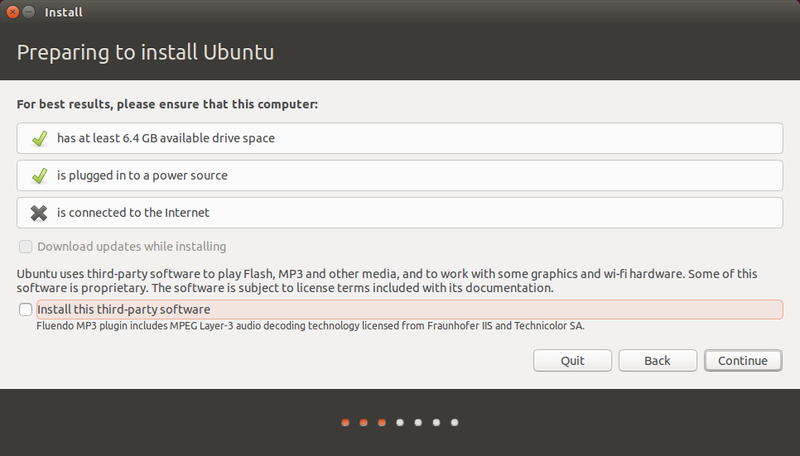 One of the options that appeared let me boot from the USB drive into Ubuntu 14.04 live and you should have a similar option available to you. 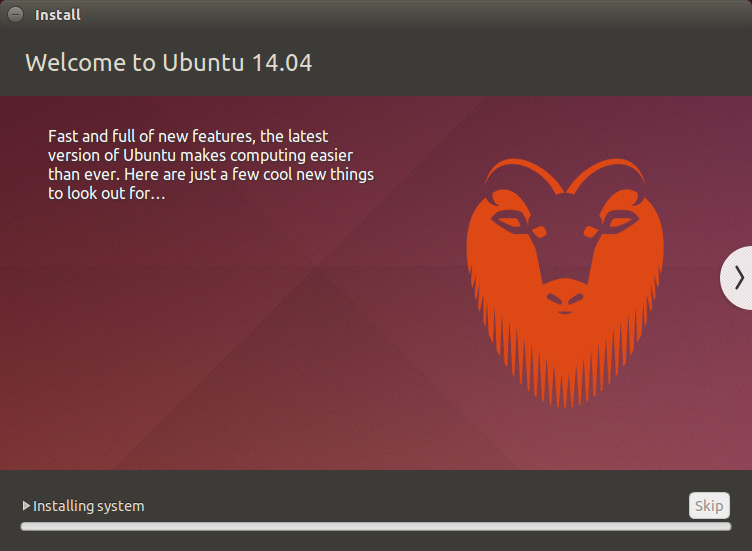 When you first boot into the live version of Ubuntu you will be presented with a screen similar to the one above. The only difference is that I have closed the window that shows all the keyboard shortcuts to make it easier to highlight the "Install Ubuntu 14.04 LTS" icon. 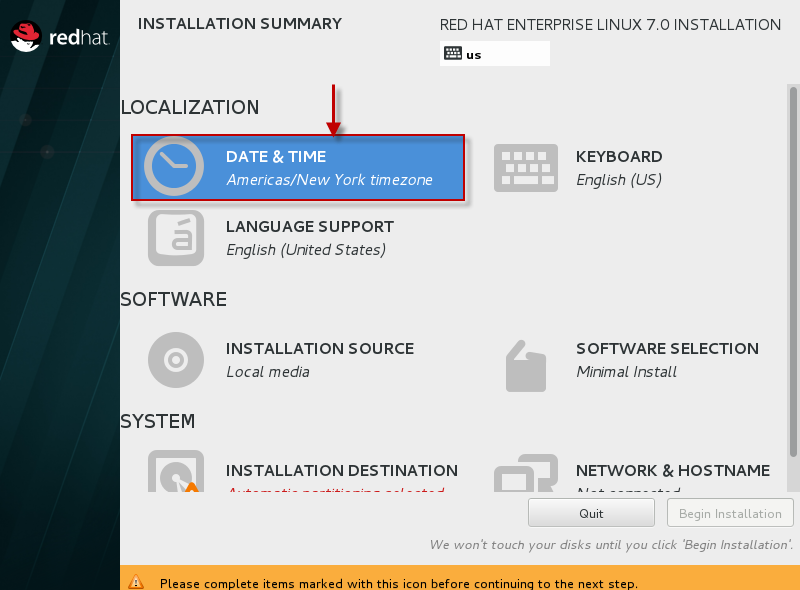 To begin the installation double click on the "Install Ubuntu 14.04 LTS" icon. The first thing you need to do is decide which language you would like to use. Unless you feel like the challenge isn't great enough I would choose the language that you would normally use. 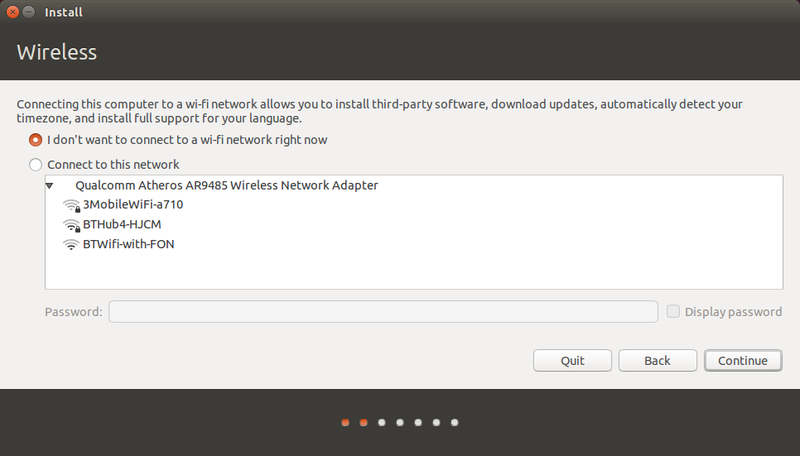 The next screen lets you choose which internet connection to use whilst installing Ubuntu. I always opt for not wanting to connect and there is a good reason for that. I live in the countryside and my internet connection is poor. I don't want the installer failing half way through because the connection dropped. I prefer to install the operating system and run updates as a separate task later on. If you have a good broadband connection you may wish to connect to it now so that you download updates as you go. This will slow down the initial install but will save time later on as you won't have to install lots of updates. 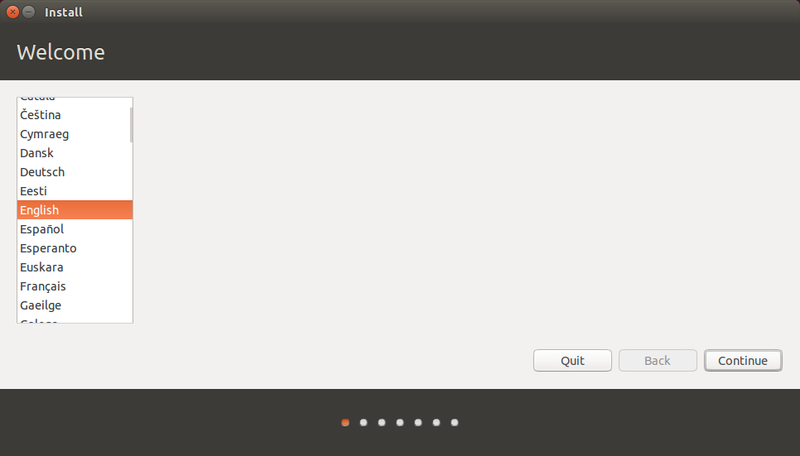 When you click "Next" you will be shown a tick list highlighting how prepared you are for installing Ubuntu. As you can see I have 2 ticks because I have enough disk space and I am plugged into a power source. I chose not to connect to a network as this stage (hence the cross). In the past there used to be an option on the "Installation Type" screen to install alongside Windows. 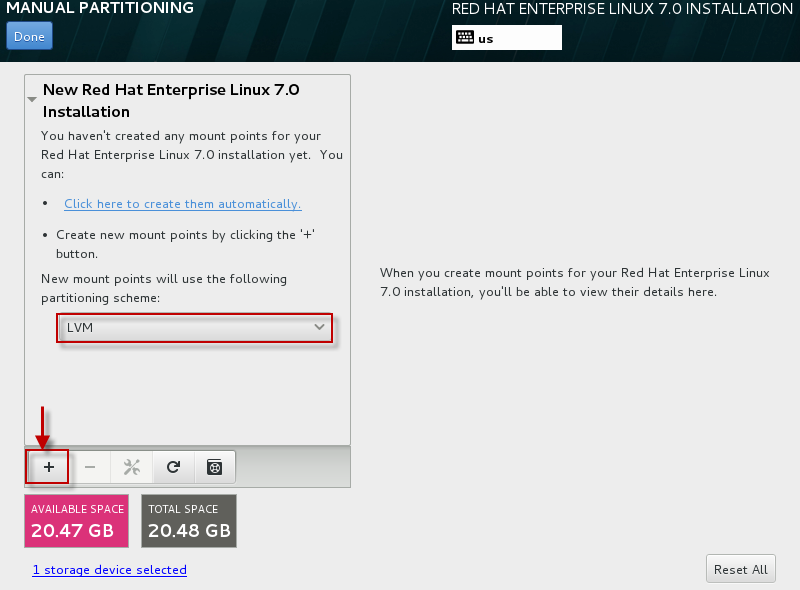 If you are installing alongside Windows 7 on a non-EFI based system then you will still have that option. Click on "Something Else" and click "Next". The next screen may look rather intimidating but it is just showing your current disk layout. Be very careful with the next few steps. If you haven't taken that Windows backup, quit the installation, reboot and follow step 1 of this tutorial again. Look at the image above. You will see a large portion of free space (710155 MB). 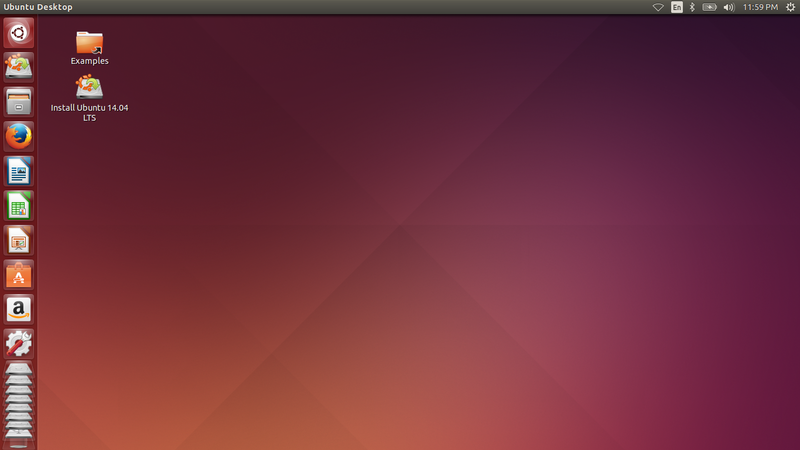 This is where I put Ubuntu. The free space is going to be split into 3. The first partition is for Ubuntu and will be 50 Gigabytes in size. The second partition is for your home partition and stores configuration files and your personal files such as music, pictures etc. 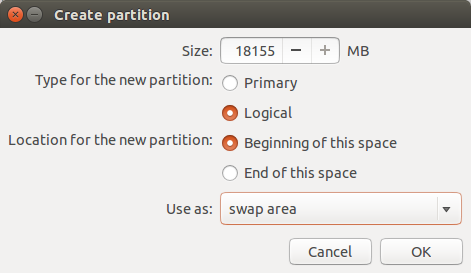 The third partition is for swap space and is used for intensive operations and suspending the computer. 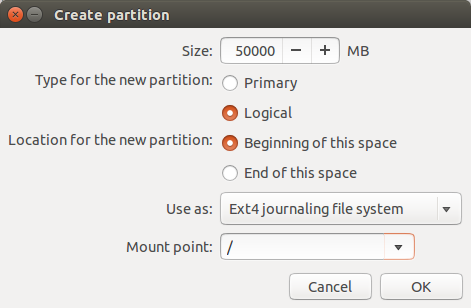 When you have found the partition with free space, click on it and press the plus symbol (+) under the disk layout. In the size box enter 50000, select logical as the partition type, select beginning of this space and choose EXT4 as the file system. For the mount point choose / (this means root). 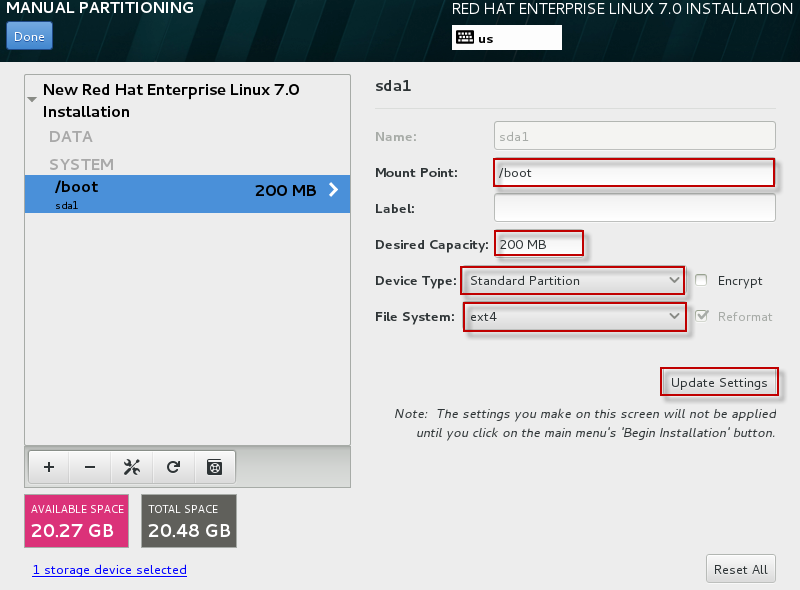 The disk layout screen should now show a new partition for /. Find the large section of free space again, click on it and press the plus symbol again (+). This time you want to set the size to be the rest of the free disk space minus 2x the amount of memory in your computer. If you have 8 gigabytes RAM, subtract 16 gigabytes. Again choose "Logical" as the partition type, beginning of this space for where to put the partition and EXT4 as the file system. For the mount point choose /home. 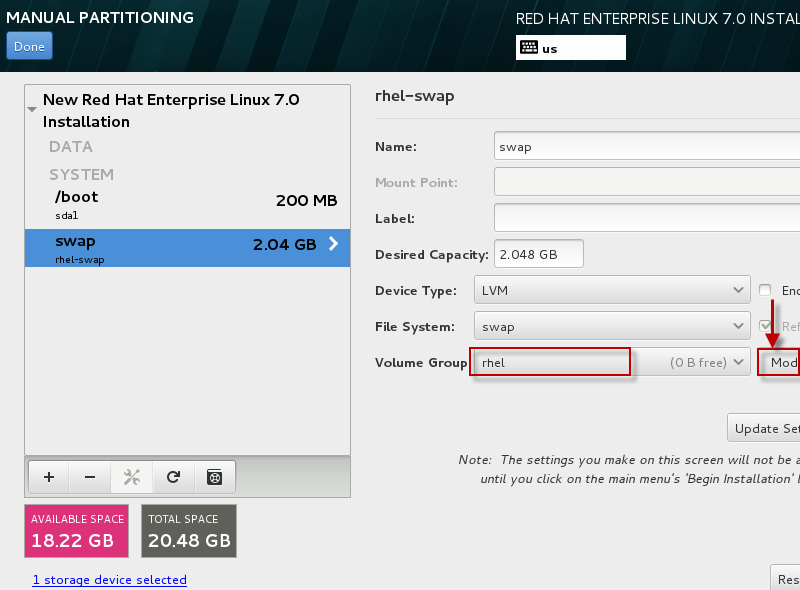 The issue of how much swap space to use is constantly up for debate. Some people say you don't need any at all, some go for 1.5 times the amount of RAM and some say 2x. Unless disk space is at a premium I would just go for the 2x and have done with it. In theory if you are running lots of intensive processes such as video editing then the swap space is used to store memory that isn't currently being used (swapped) to disk. This is disk intensive and slows down your computer but it will help to prevent a crash. Swap space is also used for suspending your computer. Now find the free disk space again, click on it and press the plus symbol. (+). Leave the size as the rest of the free disk space, choose logical as the file system and beginning of this space as the location. Choose "swap area" as the mount point. 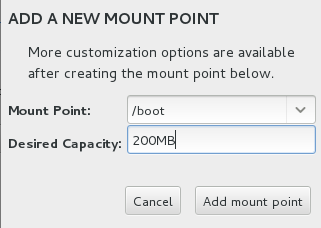 The final thing to concern yourself with when partitioning is where to install the boot loader. By default it is set to /dev/SDA on the "Installation Type" screen. This can be changed but unless you are using multiple disks you should leave this well alone. Press "Install Now" to continue. The installation has now begun but whilst it is taking place you are asked a few configuration type questions. First of all choose your location by clicking on the map. The next screen asks you to choose your keyboard layout. Simply choose the correct one for you and press "Continue". You will now be required to create a default user. 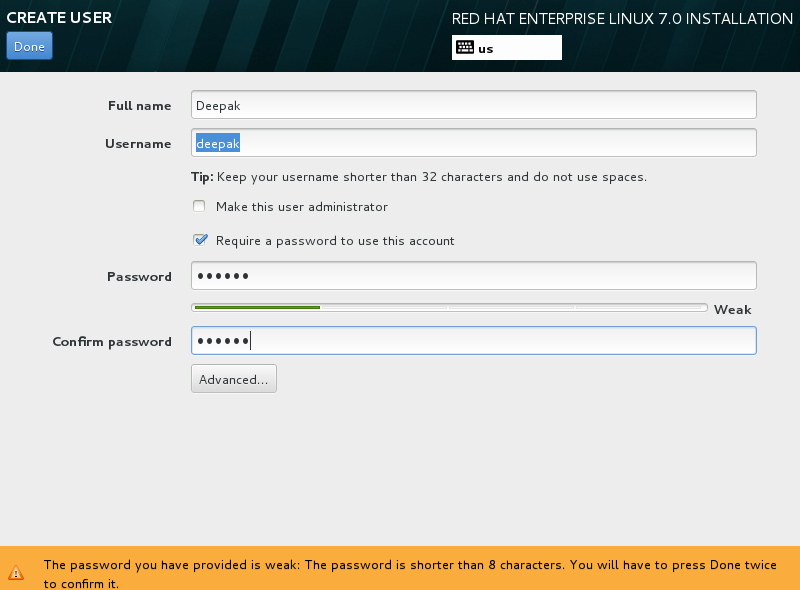 Enter your name, a name to identify your computer, a username and a password. 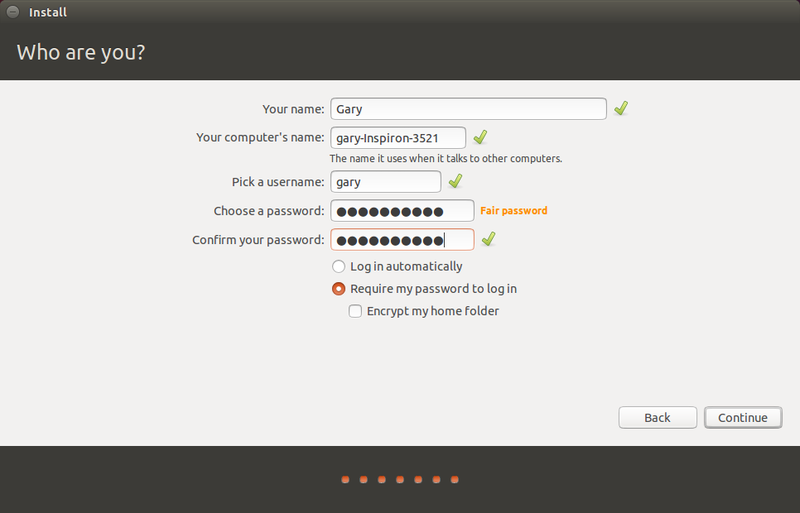 You can also choose whether to log in automatically or require a password each time. A progress bar will now show you how far through the installation you are. 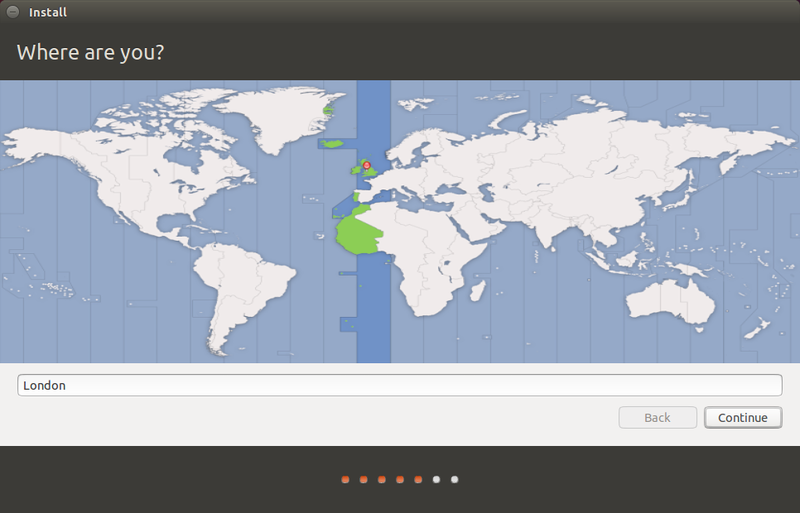 You can also view a selection of messages telling you all about Ubuntu. At this point you can take another comfort break and depending on your computer's speed you will either have time to boil an egg or wash your car. 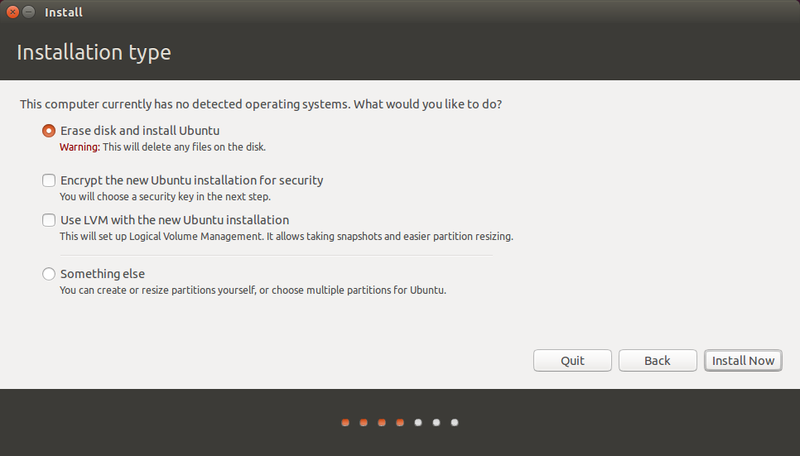 At the end of the process you will be asked whether you want to reboot to start using Ubuntu or to continue using the live version. When I rebooted it went straight back into Windows and I had to reboot back into the live session anyway. So at this point you can either take my word for it and stay in the live session or you can reboot and see if the installation has worked without any further steps required. 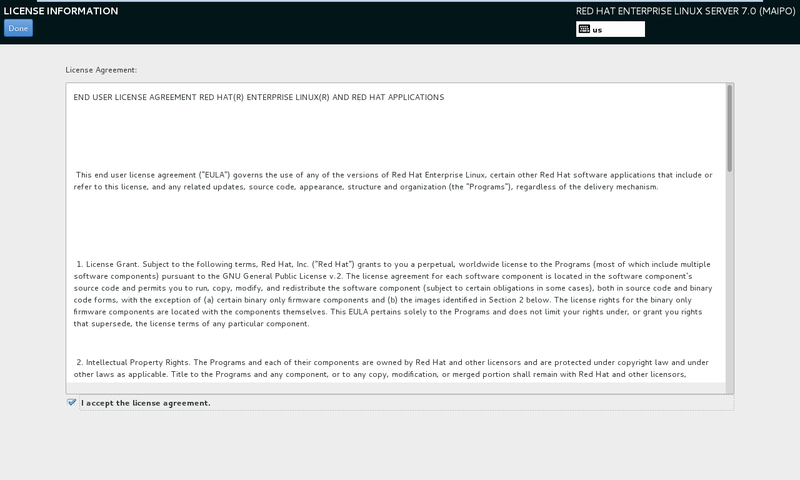 Red Hat Enterprise Linux 7 (64 bit). 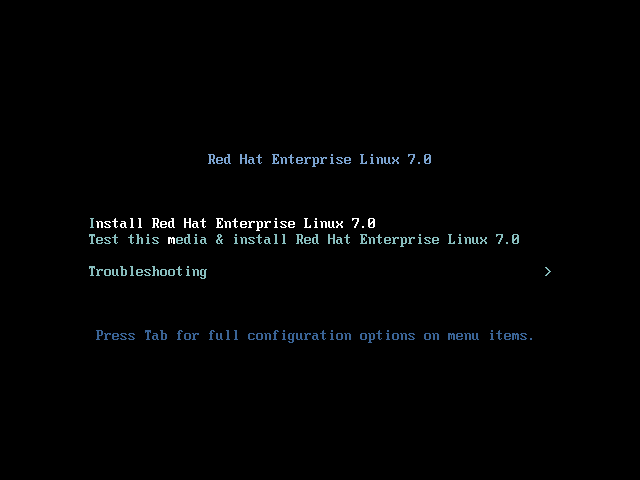 Once you insert and boot your machine with the RHEL DVD, you will get the below screen. 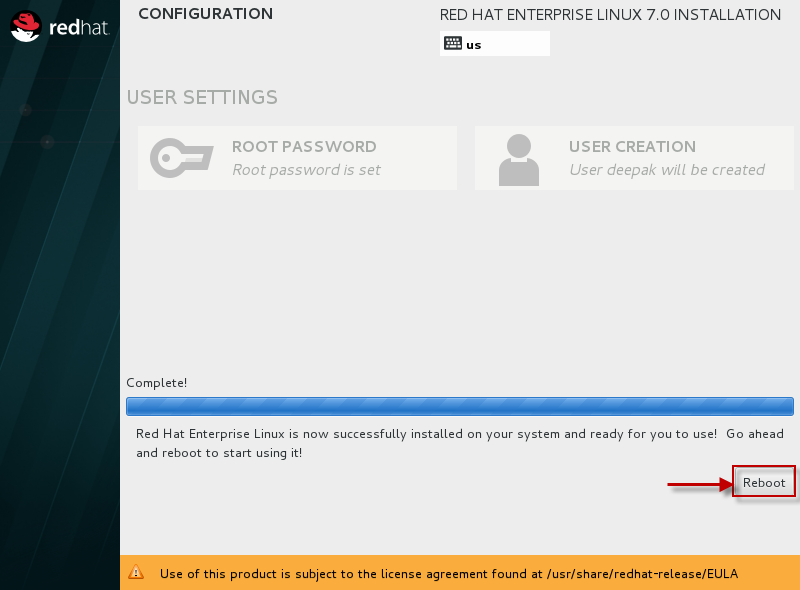 Select "Install Red Hat Enterprise Linux 7.0" and Press "Enter". The Next screen contains almost all the configuration which has to be performed for the installation. 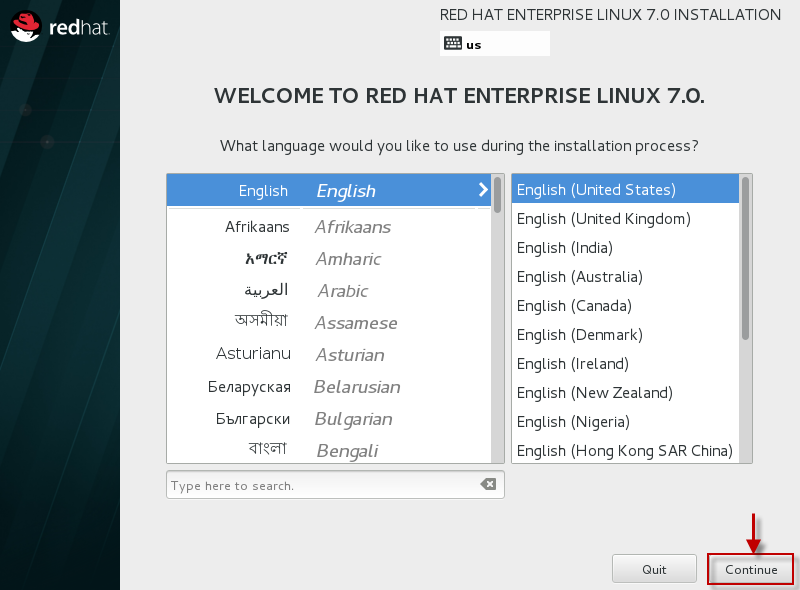 Since we have already selected our Language and Keyboard preferences, we can skip that step here. 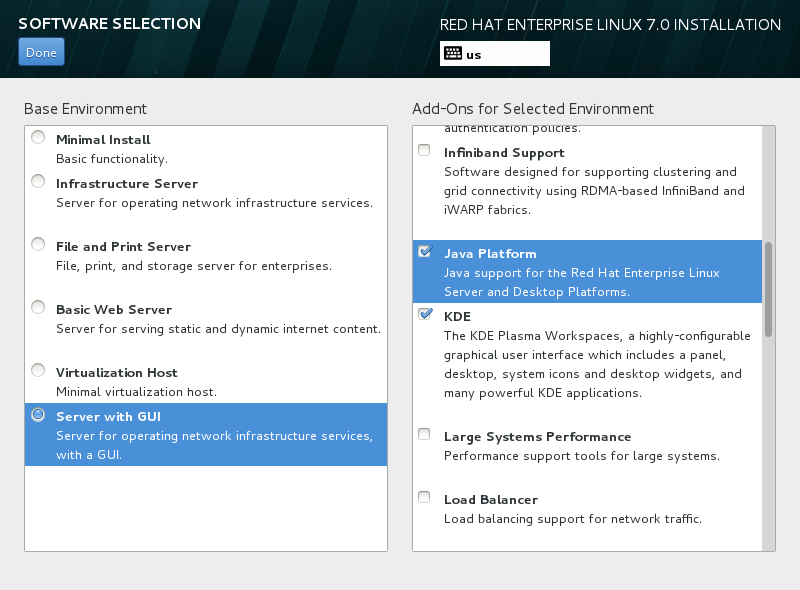 Next we will select the packages which we want to install. 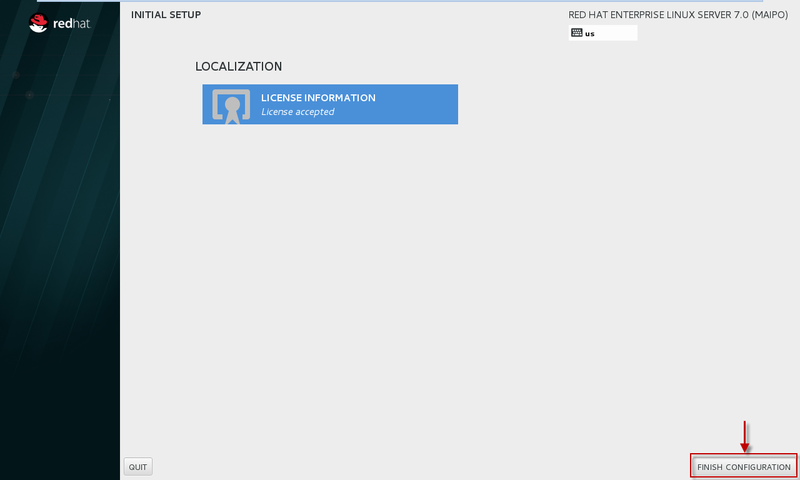 So Select "Software Installation" which will lead you to the below screen. 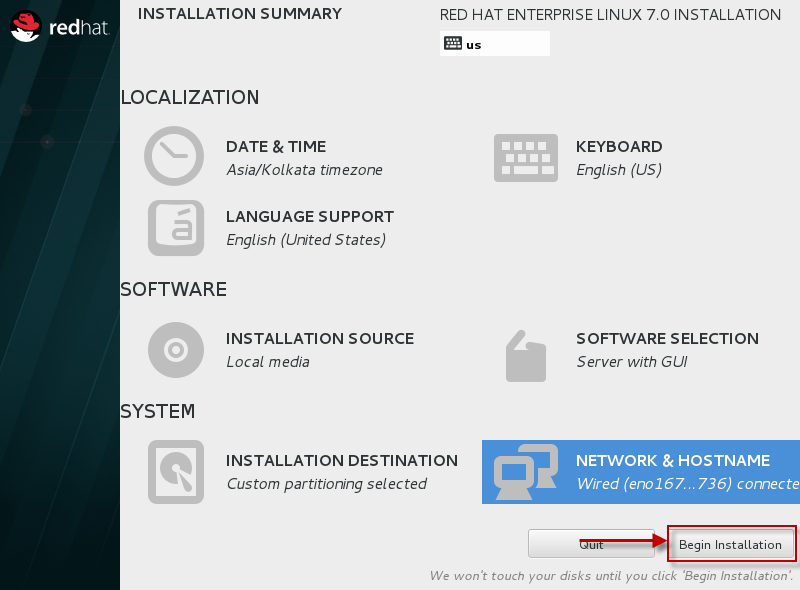 In my case I will install the "Base Installation" package having "Server with GUI" and in case you want to add any extra Add On, you can select the same from the left panel as shown below. 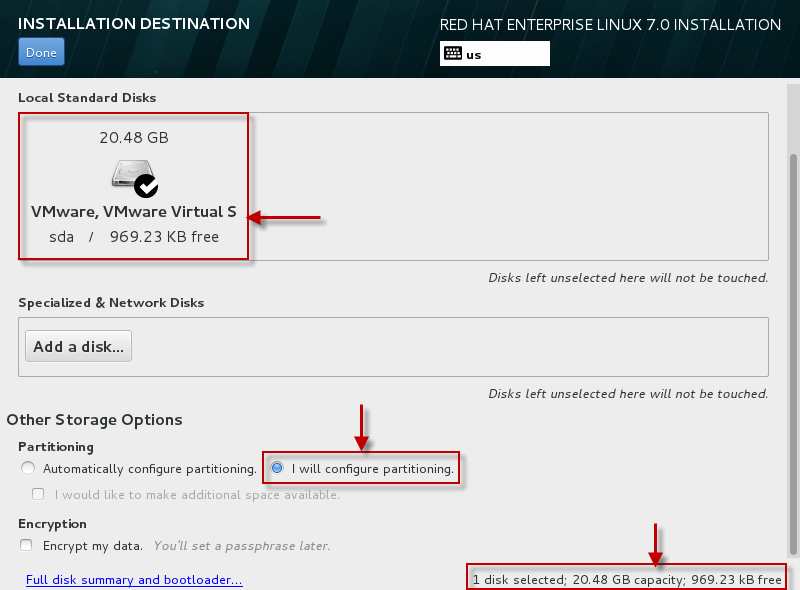 Next we need to configure partitions. 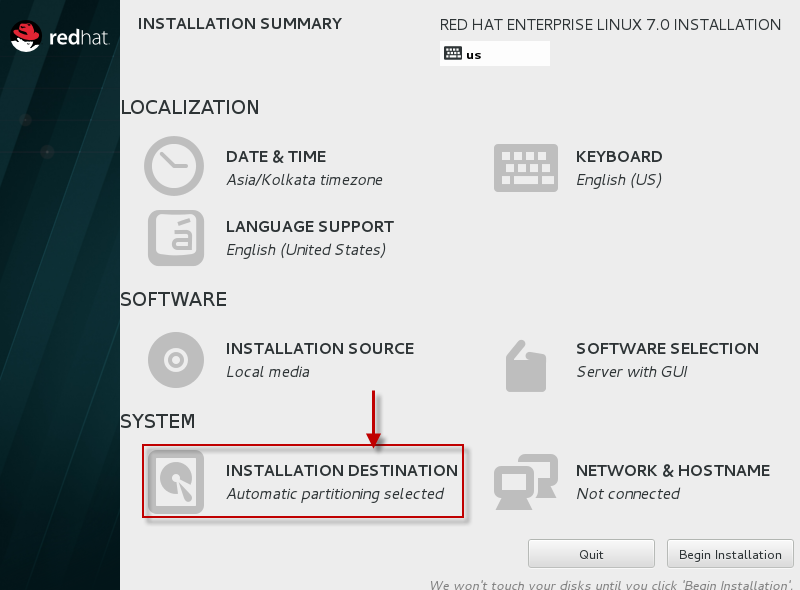 So select "Installation Destination"
Select the hard disk which you have used to install RHEL 7, as for my case as you can see 20GB hard drive. Click on the "+" sign to add new partition. 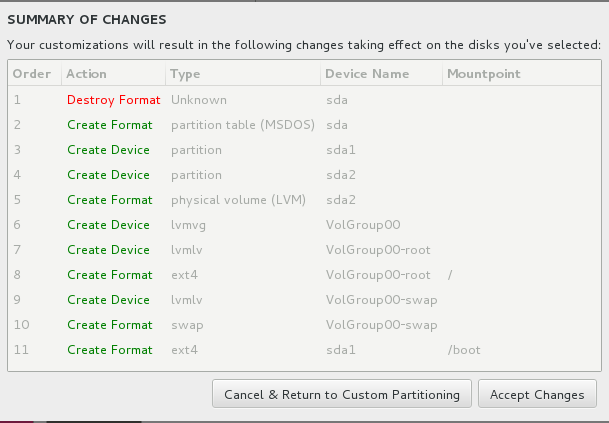 For this article I will create /boot, /, swap partition under LVM with Volume Group name as "VolGroup00"
Change the partition type to Ext4 as by default XFS will be selected for every partition you create. 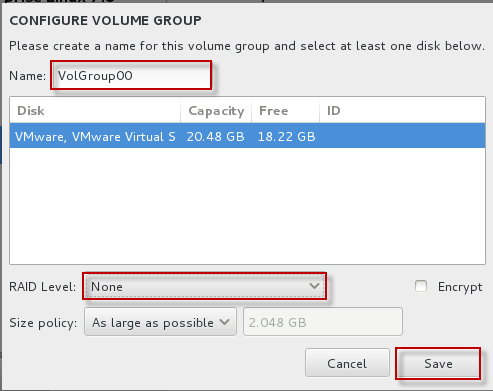 Once you change these settings make sure you "update settings"
By default Volume Group name is "rhel". 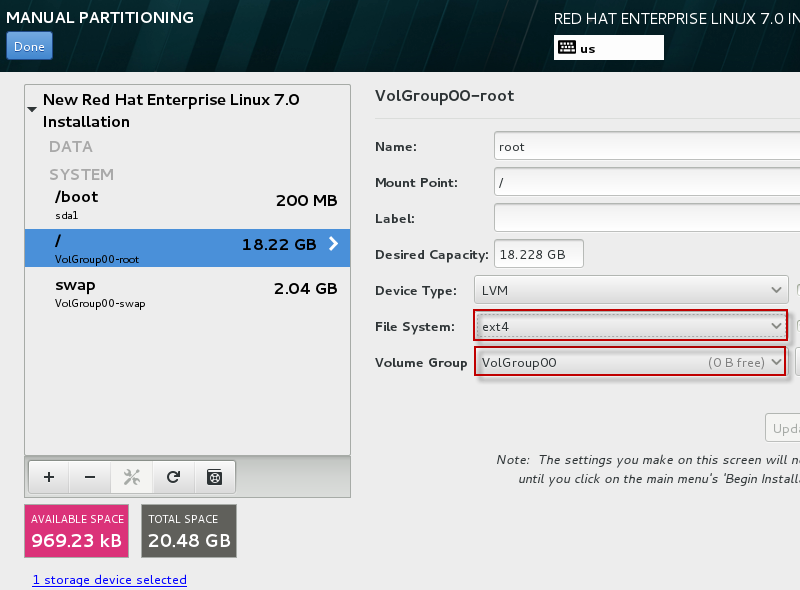 Let us change it to "VolGroup00"
You can also configure the storage for RAID but let us skip that part as of now. Click on Done and select Accept Changes. Change the Ethernet device name or else you can skip that part. 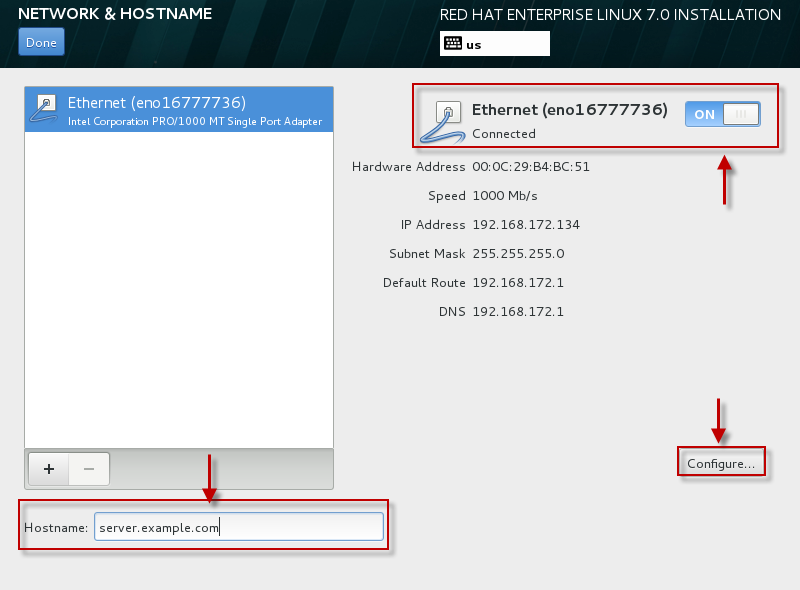 Next configure you IP details as per your environment i.e IPv4 or IPv6. 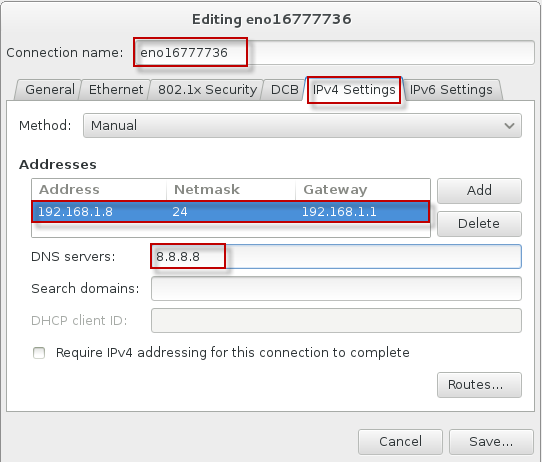 We are using IPv4 so selected the "IPv4 Settings" and added the IP, Netmask,Gateway and DNS details in the same.. Click on "Done" to save the configuration and go a step back. So we are done here with all the options on this screen. 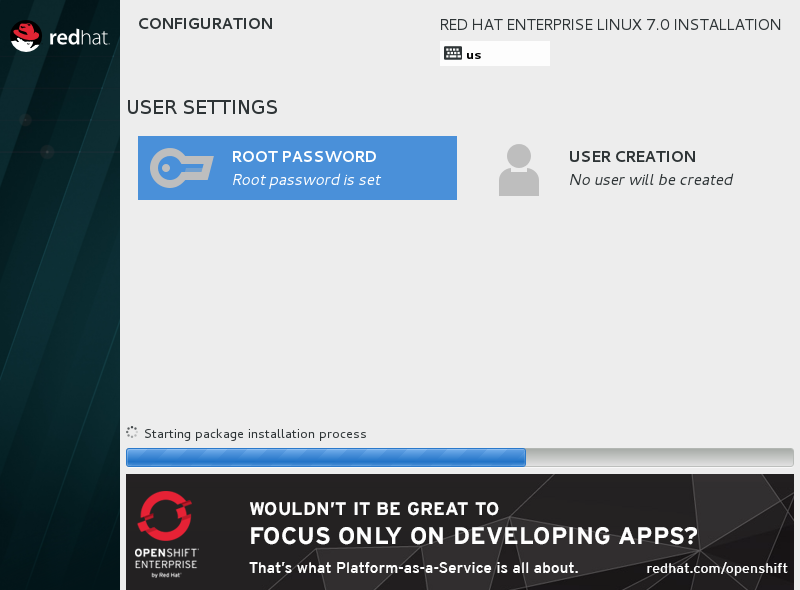 Next we can "Begin Installation"
As you see the installation has begun in the mean time you can add a password for your root user. Also you can create additional user by using the "User Creation" thumbnail. 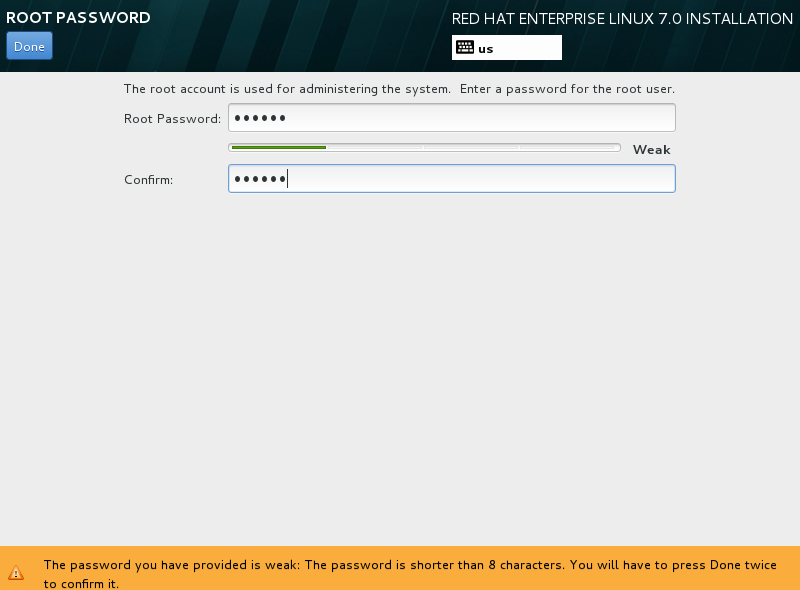 Provide a password for root account. In the mean time let the installation complete. Once done click on Reboot. Once the machine reboots, next it will prompt the below screen. 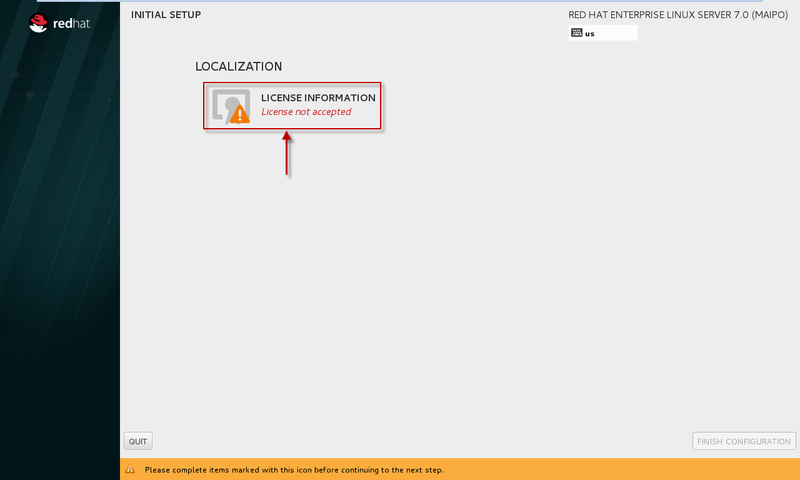 Click on "License Information"
Next you will get the Kdump configuration page. 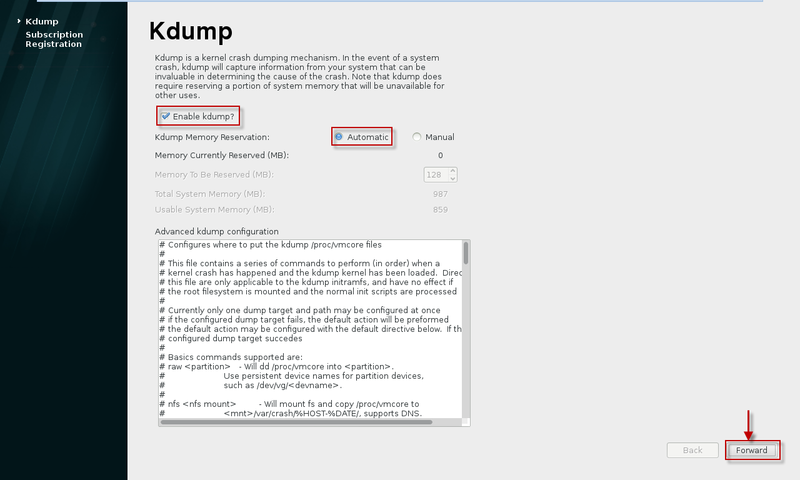 Let us enable the Kdump and let the machine decide the amount of memory required for the same. 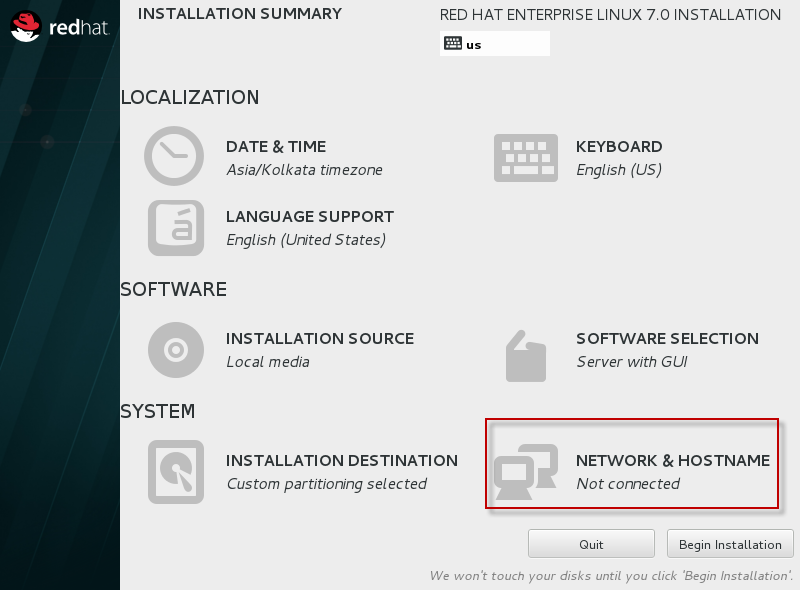 I do not want to register my system to RHN as for now,also we can perform this step later so let us skip this part for now. 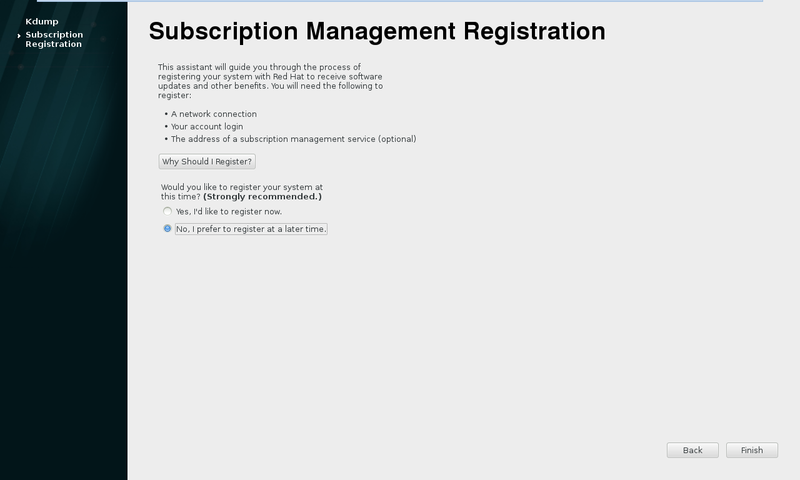 Next you get your Login Screen which means we have successfully installed our Operation System i.e. 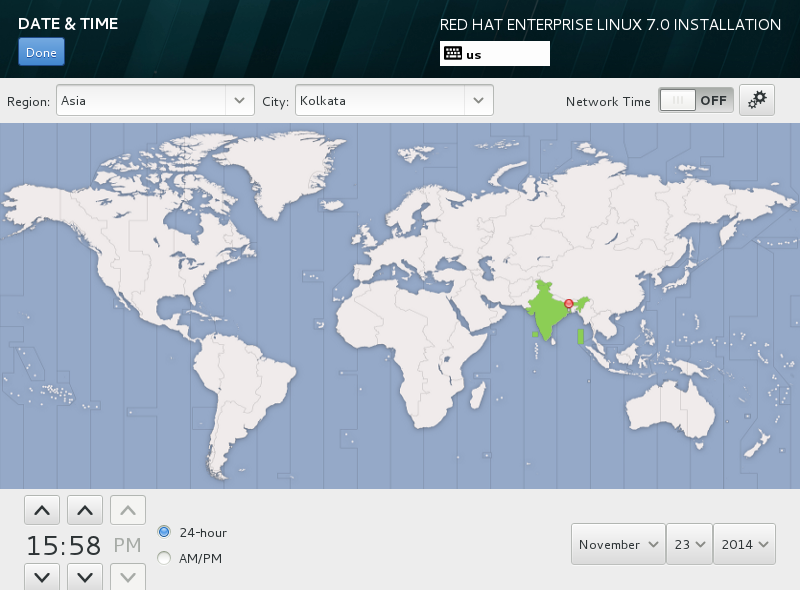 RHEL 7.0 (64 bit).